When you've put the word "Hop" front and centre in your brewery's name, it's pretty clear where your affections lie. That said, given they come from winemaking backgrounds, Sam and Dunc of Hop Nation have played elsewhere in their short life to date, with former wine barrels inhabiting their brewery venue and a beer-wine hybrid and imperial stout among the beers to have appeared already. But with The Chop it's all about the hops. It's tagged an American IPA, but one that they're not associating with any particular region as the increasingly popular style continues to spawn new variants. 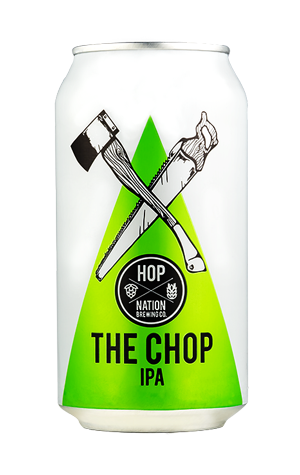 Indeed, that's why they went with the name The Chop – it's their "chopped up take on a variety of IPAs hailing from the USA". It's one that belongs in the lean and mean category: hazy and pale gold in colour and with little there to get in the way of the hops – Mosaic, Cascade, Simcoe and Ella – which deliver predominantly grapefruit aromas and flavours, and do so in a surprisingly light footed manner for a beer measuring seven percent ABV (and coming with an axe and saw on the label...).